Our Ellen in Oz project has been four years in the making and last week we learnt that Ellen is finally coming to Australia and we still haven’t finished this website. But our excitement and joy that she’s making her first trip to Australia EVER this year (March 2013) is beyond exciting. So we are now getting our skates on and finishing this website. Of course it’s changing as Bronny and I have changed during that time, this site is is a labour of love and nothing more, we just want to welcome Ellen to Australia in an Aussie way using our Aussie sense of humour as well as spreading as much of her joy and happiness around as we can! 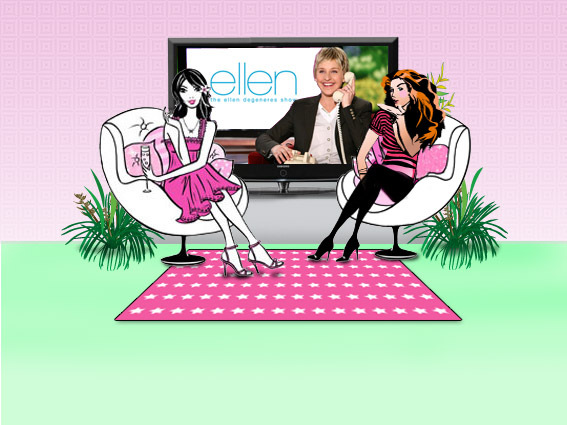 We both love and admire Ellen, for all the joy and adult silliness she brings to our days. For Sam, Ellen brings joy to her every day (well, five days a week), and it was her idea to create a campaign to let Ellen know that she has a huge fan base in Australia and how we want her to come down and share her joy and happiness around and Bronny decided to come on board and help bring that dream to reality. We so want to see Ellen’s Aussie fans dancing with her on the steps of the Sydney Opera House or even the Harbour Bridge, just like the big picnic but everyone dancing with Ellen … can you imagine??!! Driven by Sam who is just an ordinary person who has, like many people around the world, fallen in love with Ellen’s ethos and genuine goodwill to bring joy and happiness to the world. For the past five years she hasn’t missed a show (although has a bit of a backlog on Tivo at the mo’ though) and feels very blessed to be able to get her dose of joy because she works from home, but that blessing hasn’t been without personal pain. Ellen was ‘there’ for Sam, her only beacon of light, during the darkest time of her life, a time that she never thought would end. She looked forward to her show everyday whether it was a new show or a repeat because she knew that Ellen would bring a little bit light and laughter to her day regardless of what else was going on at the time. A dose of Ellen fixes everything she says! We met online about six years ago when we both first launched our online businesses (sassisam.com, sassisamblog.com and askbronny.com), although each based in Sydney and Melbourne (Sam is now based on the Gold Coast), it was tough for the two of us starting new businesses with none of the support or resources that are around today. So together we are bringing Sam’s dream to life of finishing this site. We consider Ellen an honorary Aussie (her wife Portia is Australian as everyone knows but just in case you missed that memo) and have created a magazine dedicated to a fictional trip of Ellen travelling around Australia doing all her favourite things that she loves to do with an Aussie twist of humour – of course! Together we hope that it will bring Ellen some joy as a thank you for bringing us joy when we needed it most and we hope that it will also bring someone else joy when they need it too. Thanks for visiting and supporting our vision, you can now leave a welcome message for Ellen on our Guestbook page and of course visit our Magazine page for some giggles from our little basket of joy. And don’t forget to spread the Ellen joy!